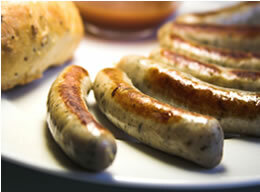 The name "Bratwurst" most often refers to a sausage made from pork in a natural casing and is grilled or fried in a pan. It is a favorite in Germany, with each region having its own specialty. Some Bratwurst are sold raw, while others are sold pre-cooked. It is important to know this so that they are properly prepared before eating. Be sure to check with your butcher or deli about the Bratwurst they have available. The most common type of Bratwurst is the pre-cooked kind. Their shelf-life is longer and they are easier and faster to grill. They are pale and stiff in appearance. These Bratwurst are fully cooked. Simply brown them in a pan or on the grill and they are finished and ready to be eaten. Raw Bratwurst are pink in color. Grilling them in their raw form requires skill because they must be fully cooked inside without burning the outside. One recommendation is to cook the Bratwurst in hot (not boiling) water for 5-10 minutes. Once fully cooked inside, brown the outside of the Bratwurst on the grill or in a pan. To grill the Bratwurst in their raw form without pre-cooking, grill them over low heat and frequently spritz them water or beer to cool the skin and prevent burning. When they look done, remove them from the heat and let them rest (covered) for several minutes. The Bratwurst will continue to cook inside which will take care of any part of the sausage that is not yet fully cooked. Each region in Germany has its own version of the Bratwurst. 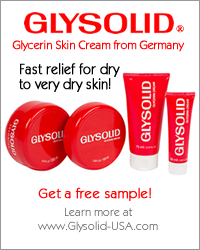 Over 50 kinds are available in Germany, differing in size, seasonings, and texture. Below we describe some of the more well-known Bratwurst. A Bratwurst originating in the city of Coburg in Bavaria. It is made from a minimum of 15% veal or beef, and its seasonings include only salt, pepper, nutmeg, and lemon zest. It is coarse in texture and measures about 10 inches in length. Traditionally it is grilled over pinecones and served in a bread roll (Brötchen). A relatively long (4-8 inches), thick, coarse sausage, originating from the Franconia (Franken) region in Bavaria. It dates back to 1573. 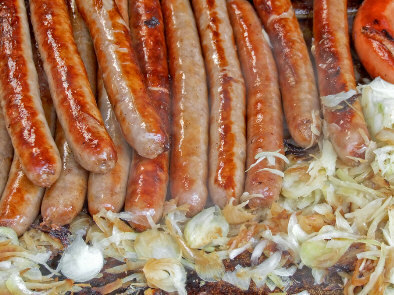 The Fränkische Bratwurst is traditionally served with sauerkraut or potato salad, but with no mustard. The Kulmbacher Bratwurst, from the city of Kulmbach in Bavaria, is made mainly from finely ground veal. They are long and thin. A small, thin bratwurst from the city of Nürnberg. It is no longer than 3-4 inches and weighs no more than 1 oz. They are traditionally served is sets of 6 or 12 (depending on your appetite) with horseradish and sauerkraut or potato salad. The Nordhessische Bratwurst (from Northern Hessen) is similar to the Thüringer Rostbratwurst in taste. It is made from coarsely ground pork and is heavily seasoned. It measures around 8 inches in length. Traditionally, it is grilled over a wood fire and served on a cut-open roll (Brötchen) with mustard. The Rote Wurst is a favorite Bratwurst of the Swabian region. It is similar to the Bockwurst, and is made from finely ground pork and bacon. Its taste is spicy. To prevent splitting during grilling or pan frying, an X is cut into the ends of the sausage. The ends open during cooking, but the rest of the sausage remains in tact, giving it its traditional shape. Thüringer Rostbratwurst The Thüringer Rostbratwurst is a spicy sausage from Thüringen. It is long (6-8 inches) and thin in shape. Traditionally, it is grilled over a wood fire and eaten with mustard and bread. The Würzburger Bratwurst, also known as the Winzerbratwurst, comes from the city of Würzburg. It's size is similar to the Thüringer Rostbratwurst, but its ingredients include white Franken wine. • To get the Bratwurst to a nice, dark brown color, brush them with beer before grilling or frying. Alternatively, sprinkle the Bratwurst with a little sugar. The sugar caramelizes, giving the Bratwurst a rich brown color. • To prevent the Bratwurst skin from splitting, heat them in hot (not boiling) water for 5 minutes. Dry them, then sprinkle them with flour. Fry them in a frying pan with a little oil or butter. • For a different flavor, add fresh sage, rosemary, or oregano to the frying pan and brown the Bratwurst with the herbs.